Theophilus Sanders and Charlotte Young. in 1865. Shortly thereafter, we believe, Isaac joined a wagon train and left Illinois, bound for Oregon. The 1870 census of Umatilla, Oregon lists Isaac, Amanda and their children: Jonathon, Sarah E. and Melinda. 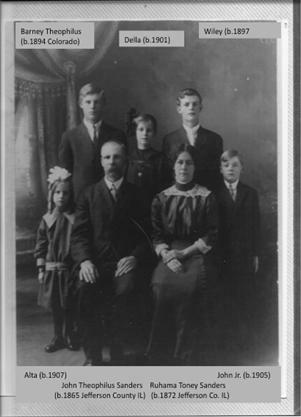 A son, William S., was born in Oregon in 1869 and is not shown in the census of 1880. He has possibly died. The 1870 census incorrectly states that the children were born in Iowa. William is not shown with the family in the census of Colorado Census of 1880. Perhaps he is deceased? 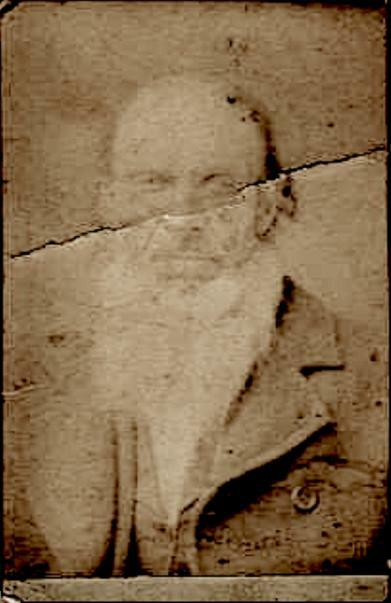 In 1871 Isaac's father Theophilus left Illinois bound for Colorado. Isaac's brother James Henry followed in 1878.
trip and life in Colorado in general and the Sanders family is noted therein several times. (Courtesy of Betty Sink and Mary Zinzellieta of Jefferson County Illinois). me no wat time he will be at Pueblo me and Isac (Isaac Sanders) will meet him. No author of this letter is evident. 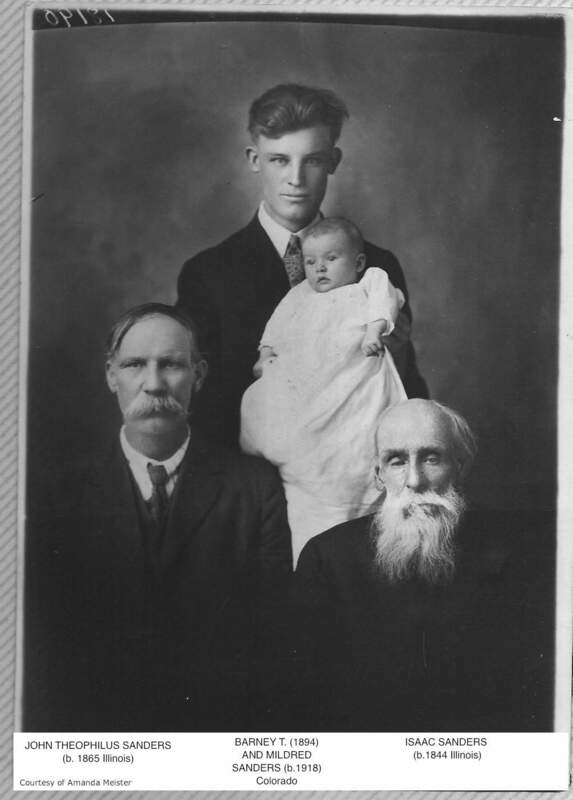 The photo below was taken circa 1920 featuring 4 generations of Isaac's Lineage. Isaac is living near the town of Florence. Isaac is listed a farmer, 37 years old with 5 kids. Jonathon T. born 1865, in Illinois, He is 15. Sarah E. 14, born 1866, in Oregon, She is 14. Melinda 12, born 1868, in Oregon, she is 12. Nancy 2, born 1878, in Colorado, she is 2. James T. born March 1880 in Colorado. He is 5 months old and subsequently died August 22, 1880. He is buried in the New Hope Cemetery. In the 1885 Census of Custer, CO Isaac is 41 years old and living with his second wife Mary (Bonner). taker that his father and mother were born in KY. (maybe this is where the Kentucky Sanders legend arises. John, in 1893 claimed 160 acres in the neighboring section, 33. (Jones) and his nephew, Henry Lively, Grandson of Theophilus and son of Mary. (In the census it states that Isaac could not read or write). correctly states their parents are born in Tennessee and Kentucky. old. The census incorrectly states his father, Theophilus is born in Kentucky, Mother in Illinois. In the 1920 Census Isaac is not to be found. death is 19 Jan 1930. Amanda and the baby died in 1880. Isaac was enumerated in all of the Colorado Census between 1880 and 1910. If Marlene Massey's family history is correct and Isaac left Colorado when Sarah Elizabeth was 14 (1880). He must have returned in 1882 to marry his 2nd wife, Mary Ann Bonner. And then left again for California after 1920. He would have been at least 76 years old when he made that trek! But he apparently did just that. In 1900 John T. Sanders, Isaac's son is shown with his wife Ruhama (Toney). He is noted as born in November 1865. In 1910 John T. Sanders and Ruhama are still in Fremont. He is listed as a Justice of the peace and is 44 years old. They have been married 20 years. 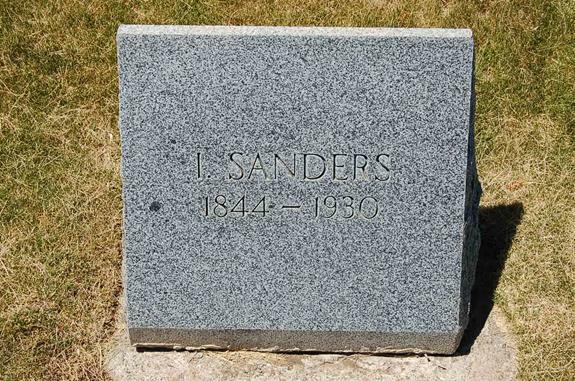 Barney Theophilus Sanders was born April 19th, 1894. He states he can read and write. John T. is now 65 years old. His 2nd wife, Florence is 65. They are living 402 Washington Street Florence, Colorado. His WWI Draft registration states he is 23 years old, in 1917, tall and slender and has grey eyes and light hair. He has had a kneecap injury. He is employed at the Mesa Flour Mill. timekeeper at an oil refinery. Ruhama            	374       	1960 Wife of Barney Theophilus. John                	380         	2 Nov 1939, Son of Isaac.